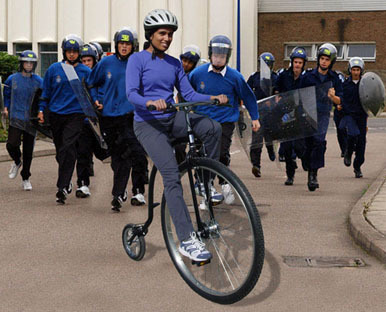 This photo is doctored but it’s indicative of the kind of riotous fun that will occur during the Bring Back the Bikes event at Revival Bar (783 College Street, Toronto) on Friday June 2nd. I met Matt Morrish at the Toronto Group Commute yesterday and he was so taken by the Coker penny-farthing that he’s arranged to use it in the active wear clothing fashion show for the Canadian Children’s Cycling Foundation. The CCCF’s mandate is to raise money to purchase and distribute new and used bikes to inner city youth who cannot afford to do so. This morning, Toronto celebrated Bike to Work Week with a group commute and pancake breakfast. The Community Cycling Organiser for the City of Toronto had contacted me about having some of my bikes involved. Originally, it wasn’t clear who would be lined up to ride the bikes, but there was talk of various celebrities and politicians. 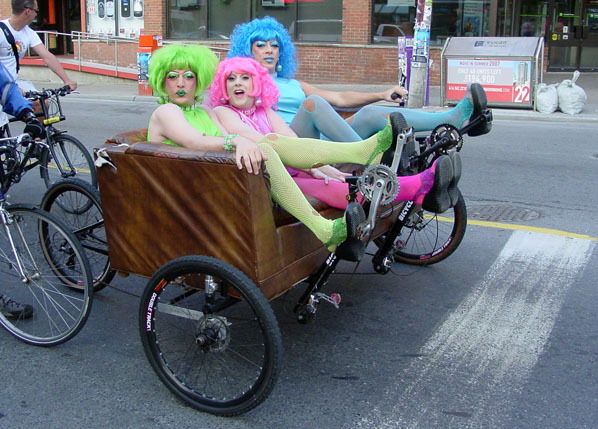 Shortly before the day, it was proposed that a three piece drag queen act called the B-Girlz would ride the couchbike and that we would commence the ride from the corner of Church and Alexander as part of a sub group called the Pride Ride. Aside from some mild anxiety about how this might impact my chances with the single ladies, I agreed that this sounded like fun. Because of the transit strike, the B-Girlz were a little late in arriving, but eventually they emerged from a taxi in all their pink, lime and turquoise glory. The start of the ride was mostly uphill. I was concerned about how the girls would fair in climbing the steep slope, especially with their crazy high heels and the weight of the third one sitting in the middle, but they seemed to manage it with great ease.On the downhill section on Yonge Street, the girls were surrounded by vehicles from the media. I was pretty nervous because there is a definite art to braking on the couchbike. I knew from experience that if anything went wrong, we could have a really ugly situation on our hands. In the video you can hear my nervous laugh as one of the B-Girlz suggests, “Let’s see how fast we can make this thing go”. Fortunately, the B-Girlz once again impressed me with their skilled couch handling. The video ends with a short photo op with Jack Layton and Olivia Chow. You are currently browsing the Bicycle Forest Blog weblog archives for May, 2006.